November 22, 2018 December 18, 2018 - by rizwan - 2 Comments. The Punjab Educational Endowment Fund (PEEF) announced scholarships for master level students in all over the Punjab province of Pakistan. PEEF year session 2017-18 awarded more than 235,000/- scholarships worth Rs. 11.9 Billion and endowment fund is Rs. 17-10 Billion. more than 12000/- fully funded master’s level scholarships. secure admission in any partner university or Government post graduate college of Punjab. kindly note that applications submitted directly to PEEF office will not be entertained. for list of partner universities and eligibility criteria for PEEF Master Level scholarships visit peef.org.pk. – Day scholar Rs. 3,000/- per month. – Border Rs. 5,000/- per month. 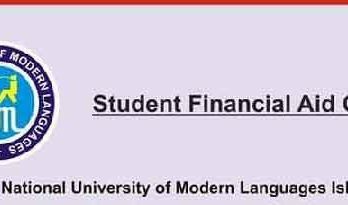 It is notified for the information of all the Graduate Programs students who have Punjab Domicile that PEEF Master Level Scholarships are available in NTU Student Financial Aid Office for deserving students. Students who meet all the prescribed conditions may apply on the form available at the University Photocopier Shops. Application forms along with all supporting documents may be submitted in the office of the undersigned. Secured at least 60% marks or a minimum CGPA 2.5 in BA/B.Sc./B.Com/BS/BBA examination held in 2016-2017-2018 (Annual). Declared monthly income of his / her parents (from all sources) should be equal to or less than Rs. 30,000/- (Children of Govt. Employees in BPS-1-4 are exempted if salary is only source of income). Students should not availing scholarship from any other Agency / Source. Students should not be banned by the University Disciplinary Committee for scholarships or beneficial schemes. sir i want to know that i am student of 7th semester can i apply for that scholarship? Sir I want to know that if monthly income is more than 30,000 than the student is not eligible to apply??? ?